In today’s Overwatch League matches, the Dallas Fuel learned a hard lesson about everybody funneling through the same door. 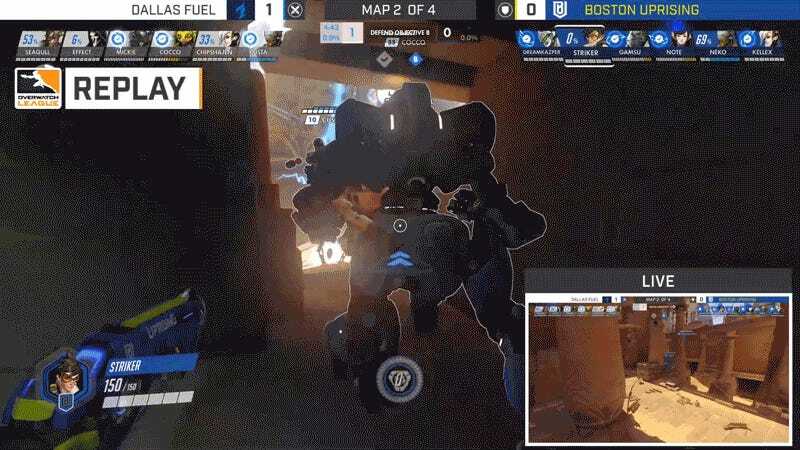 As the team backed up into a side area, the Boston Uprising’s Namju “Striker” Gwon was waiting on Tracer. With a sticky Pulse Bomb primed and ready, Gwon snuck in and stuck one, catching four members in the full blast of it. YoungJin “Gamsu” Noh cleaned up the rest with a primal Winston, and that was the end of that push. Dallas and Boston’s match would go into a fifth map, where Boston would win it in the extra rounds. If you want to catch more Overwatch games, you can find them over at the League’s Twitch channel.